"Imagine living in the wilds of western Virginia during the early settlement of what would become Kentucky. Despite the solitary stillness of the early morning, this could be one's last day alive. Was that the sound of a bird or an Indian signal to attack? White settlers, hunters, Revolutionary War soldiers, and entrepreneurs were streaming into the sacred hunting grounds of the Native Americans who soon found their very existence threatened. Rebecca Bryan Boone and her household had to constantly be at the ready for Indian attacks — a grim reality in the new frontier. Sue Ballard's fresh approach to the wife of the famous frontiersman, Daniel Boone, offers an insightful view of the hopes, hardships, happiness, and horrors that most American pioneer women confronted. Rebecca narrates her story in dialect commensurate with the period. Ballard's skillful presentation engages the reader and vividly brings to life the everyday experiences of her subject." "Much has been written about the adventurous frontiersman Daniel Boone. Author Sue Ballard documents the life of Daniel's wife, Rebecca Bryan Boone, a woman who deserves tribute for her role in carving new homes and new lives in the primitive and dangerous Kentucky wilderness. Ballard's description of Rebecca's day-to-day life is accurate in each detail, from raising their many children, farming, and kitchen work, to her hourly prayers and waiting in loneliness for the return of her trailblazing husband. Ballard's narrative voice takes hold of the reader from the first pages and sweeps us back to relive those earliest days of Kentucky history. This evocative book inspires admiration for Rebecca as a fine representative of our revered pioneer women whose bravery and strength established the way for following generations." 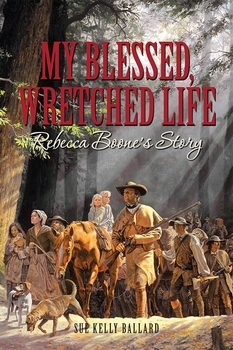 "Rebecca Boone's story is a must-read for all who love early American and Kentucky history. My Blessed, Wretched Life is history, adventure, memoir, and love story. Its Kentucky pioneer characters become people we intimately understand with all their strengths, weaknesses, joys, fears, and sorrows. Rebecca married an extraordinary man, Daniel Boone. Equally she was an extraordinary woman. The author, Sue Ballard, has carefully researched the historical facts in order to build Rebecca's world and use Rebecca's voice to tell her astonishing story. This book is for those who have already studied this tumultuous era. It is also for those who come to our pioneer history for the first time. The reader will turn its pages eagerly, absorbed by a saga emerging from the past as imagined by a fresh new author and a master story teller." Kentucky-born author Sue Kelly Ballard became inspired to tell the amazing story of pioneer mother Rebecca Boone when she lost her own mother while still in graduate school. Ollie Lee Hays Kelly, a dedicated army wife, raised five children in several states and overseas under ever-changing circumstances. Thus Sue, the eldest, came to fully appreciate how vital a mother's love and work is, not just to her own family, but to future generations. According to family lore on her mother's side, the Hayses are descended from Rebecca and her husband, Daniel Boone, through their daughter Susannah, who married William Hays in 1775. Both of Ballard's parents descend from Revolutionary War veterans, and her husband's forebears were among the early pioneer visitors to Boonesborough, Kentucky. Ballard began her career in the corporate world in Kentucky, Arkansas, Colorado, and Indiana, and is now a professor of chemistry at Elizabethtown Community and Technical College, where she nurtures her creative side with a love of travel, history, literature, and writing. She resides in Elizabethtown, Kentucky, with her husband, Jimmie, and two cats.